California Governor-elect Gavin Newsom has declared a state of emergency in at least three counties. Ventura County, CA – A raging inferno that has already burned dozens of homes in multiple Ventura County communities is now bearing down on Malibu, prompting the evacuation of approximately 88,000 homes as of Friday morning. The homes of many celebrities lie in the path of the fire. The inferno, dubbed the Woosley Fire, ignited on Thursday afternoon, just south of Simi Valley. Overnight, it exploded. The blaze is zero percent contained, and is being fueled by strong Santa Ana winds that are predicted to reach gusts of 40 to 50 miles per hour in the valleys and 60 to 70 miles per hour in the mountains throughout Friday. Approximately 2,000 firefighters are working to quell the flames. Homes in Westlake Village, Thousand Oaks, Oak Park and other communities in the area have been lost in the 14,000-acre blaze. Early Friday, residents in Calabasas and Malibu were ordered to evacuate, after the fire jumped across the 101 Freeway and continued on towards the Pacific Ocean. By 12:27 p.m., Malibu officials warned residents that the fire had moved into populated areas. Traffic along the Pacific Coast Highway has also gridlocked due to the sheer number of people trying to get out of the path of the blaze. Power outages that have affected traffic control signals have further complicated the evacuation for motorists. 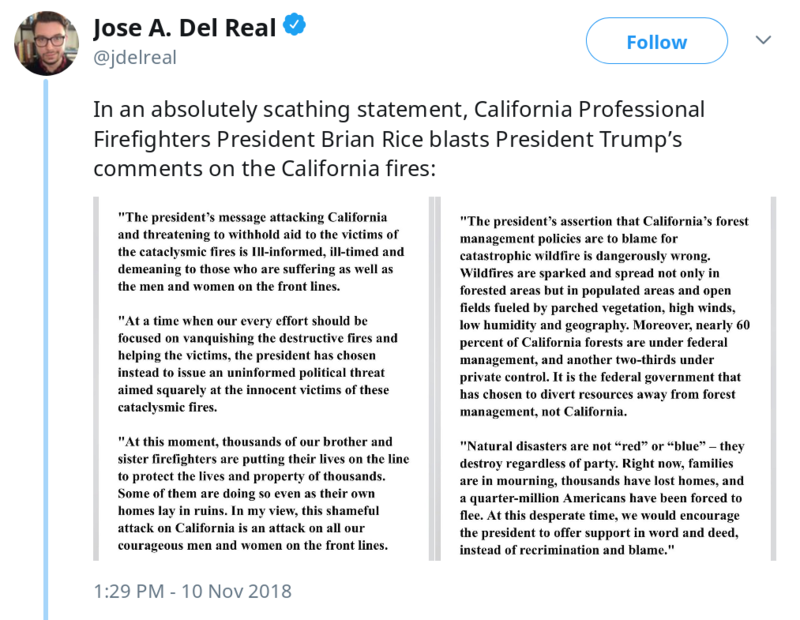 The Woosley Fire, in combination with the 6,000-acre Hill fire nearby, and an even larger blaze in northern California, prompted Governor-elect Gavin Newsom to declare a state of emergency for Butte, Ventura, and Los Angeles counties. Fire officials said they expect the Hill Fire to proceed all the way to the ocean, and redirected firefighters in the area to the Woosley Fire. Meanwhile, another blaze in Northern California’s Butte County ravaged through the town of Paradise, engulfing as many as 1,000 structures, Variety reported. Camp Fire ignited at approximately 6:33 a.m. on Thursday, and had burned an estimated 70,000 acres as of 10:30 a.m. on Friday. Roughly 15,000 structures are situated in the fire’s current path. According to BBC, five victims were found burned to death in in their vehicles in the decimated town of Paradise. They bodies were too damaged to be positively identified as of yet. The Butte County Sheriff’s Office said that they have received reports of additional fatalities inside the fire zone, but that they have been unable to access the area because “the fire is still active and there are many hazards in areas where fatalities have been reported,” according to The Washington Post. The town was home to approximately 26,000 people. “There’s nothing left standing,” California Fire Captain Scott McLean said of Paradise, according to BBC. Butte County Supervisor Doug Teeter said rescuers used a bulldozer to shove abandoned vehicles out of the roadway in order to reach an engulfed hospital to evacuate patients. “Pretty much the community of Paradise is destroyed,” Capt. McLean said, according to the Associated Press. “It’s that kind of devastation. The wind that was predicted came and just wiped it out." At least two firefighters have also been injured in the Camp Fire blaze. According to The Washington Post, 52,000 people have been evacuated as a result of Camp Fire. Why would anyone want to live in California. Besides having idiots running the government, you have to contend with fires, earthquakes, mudslides, extreme winds and @Hi_estComnDenomn.